In June, Joe and I spent a few days vacationing in Florida. We spent the majority of our time near Cocoa Beach where we enjoyed long walks along the beach. Also, we spent a day at the Kennedy Space Center which gave us chills at times taking in all the history of the space program. They house the Atlantis Space Shuttle there and it’s an amazing sight to see in person. One day we drove inland for a day trip to Orlando and spent a few hours at Downtown Disney. We weren’t there to go to the theme parks, just a day to spend walking around and enjoying the atmosphere, shop and enjoy some good food. We stopped by Wolfgang Puck’s Cafe and enjoyed a light lunch. I wasn’t particularly hungry so I ordered the Bruschetta with roasted tomatoes, pesto, topped with fresh arugula and shaved parmesan. The first thing I tasted was the tomatoes. The texture was thicker than roasted tomatoes and had a caramelized sweetness that tantalized my taste buds. Every bite was an experience in sweet tomato flavors with a hint of saltiness in the background. The pesto was fresh with olive oil dripping over the side of the toasted bread and it was all topped with fresh arugula and shaved parmesan. I made a note to self to make this when I got home. My version is close but I added some bacon bits and brushed my Arugula pesto over the bread with some chiffonade basil leaves. I made a little sugary blend to sprinkle on top to try and recreate that sweet caramelized flavor. I came pretty close, see what you think! 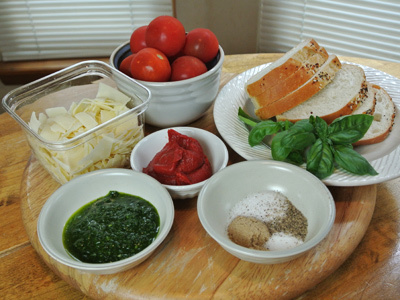 For the brushetta you will need a pint of cherry tomatoes, some tomato paste, arugula pesto, sliced french or sourdough bread, shaved parmesan and a little blend of my own I call brushetta sugar. I cooked up some bacon bits as well to add on top but it’s optional. 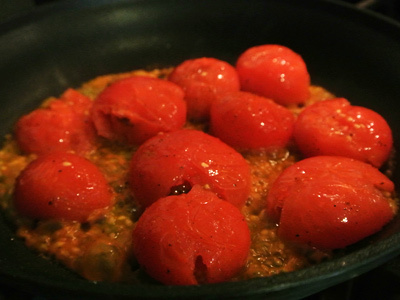 In a medium sized skillet over medium high heat, drop the tomatoes into the skillet and drizzle olive oil along with a sprinkle of salt and pepper. As the tomatoes begin to heat up they will start to soften and even appear charred. Toss them often so that they roast on all sides. After a few minutes they will begin to break down and release their juices. At this point, take a potato masher and crush them down. 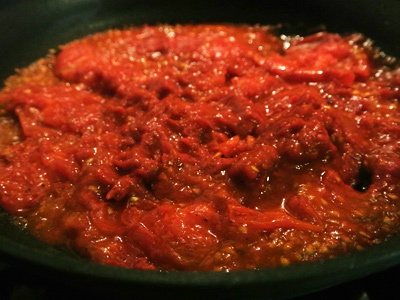 Stir in 2 tablespoons of tomato paste to thicken the tomatoes. 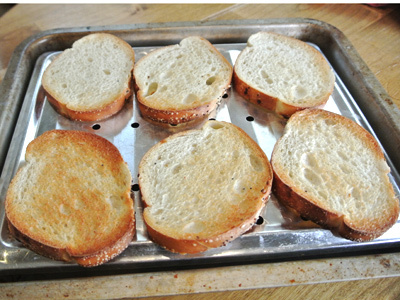 Toast your bread so that it is crisp and lightly browned. 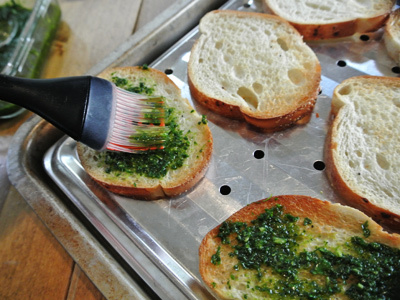 Brush the pesto over the toasted bread. Top with the thickened tomatoes and add a light sprinkle of brushestta sugar over top. It consists of sugar, brown sugar, salt and a peppercorn blend. Also I added some bacon bits, just because I felt like it! But you can go vegetarian if you want. I placed them back in the toaster oven on the bake mode at 400 degrees. 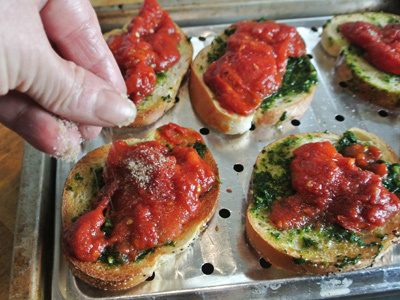 Bake 2 – 4 minutes, just until the toast begins to brown around the edges and the bruschetta sugar melts into the tomatoes. Take them out of the oven and sprinkle a few bits of shaved parmesan and chiffonade basil over top. From the sweet roasted tomatoes to the crunchy toasted rounds slathered in pesto, you won’t find a better appetizer. Enjoy! Fry bacon bits over medium high heat until they are crisp and brown. Remove to a plate lined with a paper towel and set aside. 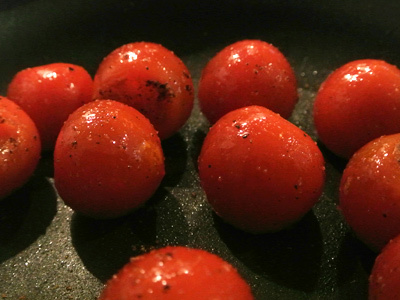 Drop the cherry tomatoes into a heated skillet over medium high heat. Drizzle with olive oil and sprinkle some salt and pepper over top. 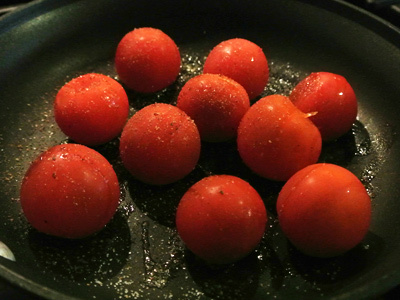 Toss the tomatoes in the pan as they begin to warm up. They will begin to char slightly and the peel will begin to split. As the tomatoes break down crush them with a potato masher and add the tomato paste. Stir together until the tomato mixture is thickened. Turn off the burner and set aside. Toast the bread until it is lightly crisp and browned. 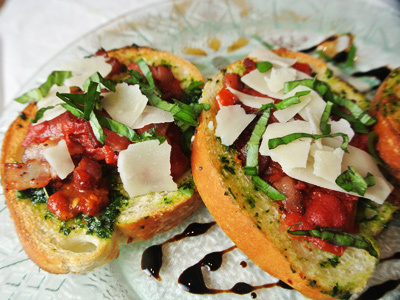 Brush toast with some arugula pesto and add a tablespoon or two of roasted tomatoes. 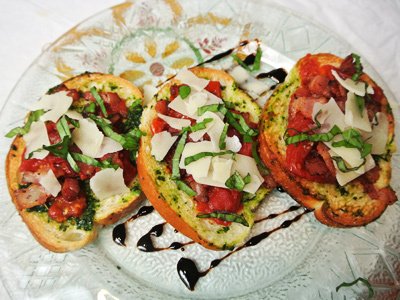 Sprinkle with bacon bits and bruschetta sugar. Pop back in the toaster oven on the bake mode at 400 degrees for 2 – 4 minutes. Just long enough to brown the edges of the toast, reheat the tomatoes and melt the sugar blend. Remove from oven and top with shaved parmesan and basil. Makes 10 – 12 toasted rounds. Mix all the ingredients together. Sprinkle over tomatoes. Thanks so much, Stephy! 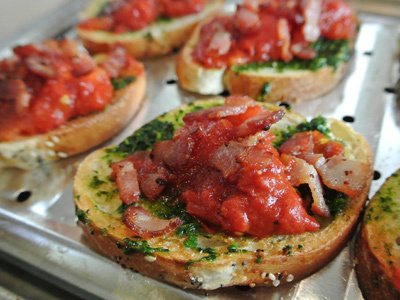 I enjoyed making them and I think I captured the tastes behind Wolfgang’s bruschetta.